At least eight people have been killed in a suicide bomb attack on Sri Lanka's army headquarters, while the head of the army has been seriously injured. Lt Gen Sarath Fonseka is said to be in a stable condition after surgery in Colombo, where the attack happened. The military has blamed Tamil Tiger rebels for the attack and launched air strikes on their positions in the east. There has been a surge in violence in Sri Lanka recently, and the Tigers last week pulled out of planned peace talks. Responding to the latest attack, President Rajapakse said he would not be cowed by terrorism. "I emphasize and caution that one should avoid mistaking our desire for peace and our responsibility to achieve it as a government, as weakness," he said in a televised address. This is the first suicide bombing in the Sri Lankan capital since July 2004, and the biggest attack blamed on the Tamil Tigers since they signed a truce with the government in 2002. Though the ceasefire still officially holds, Sri Lanka appears to be heading back to war, the BBC's Dumeetha Luthra reports from Colombo. Military officials say the attacker was a woman who made herself appear heavily pregnant to conceal the explosives. She presented fake identification and said she had an ante-natal appointment at the army hospital inside the complex, unnamed officials told the Associated Press news agency. A Sri Lankan military spokesman who spoke to the BBC said the attacker blew herself up as Lt Gen Fonseka was leaving his office "just in front of the army hospital". Twenty-seven people were wounded in the attack, the army said. It is not clear if the bomber was included among the eight people said by the military to have been killed in the blast. The army headquarters are in a heavily guarded compound in central Colombo. 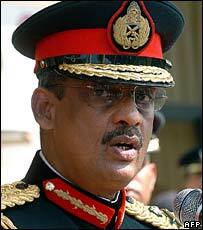 Lt Gen Fonseka is reported to have suffered severe abdominal injuries and was taken to hospital. A team of 10 surgeons operated on him and he is now said to be in a stable condition. Lt Gen Fonseka was appointed head of the army shortly after the election of President Mahinda Rajapakse last November and has taken a hard line against the Tamil Tigers. The Sri Lankan military says it has begun an aerial assault on rebel positions in north-eastern Sri Lanka, telling the BBC it could not stand by after the attack on its headquarters. The military said the Tigers had earlier attacked Sri Lankan naval positions in the north-eastern district of Trincomalee. A Tamil Tiger leader in Trincomalee, Mr Ezhilan, told the BBC that civilians in the area had been fleeing shelling by the army. Police said the explosion in Colombo bears all the hallmarks of the Tigers. Tamil Tiger rebels frequently use suicide bombers in their operations - and are thought to have carried out nearly 200 attacks since the first suicide bombing in July 1987, when a bomber in a truck filled with explosives killed 40 soldiers. The rebels have denied being behind recent attacks. Escalating violence in the north and east of the country has left about 100 people dead in the past three weeks. The Tigers began their armed campaign for a separate homeland for the island's Tamil minority in the 1970s. Efforts are continuing to persuade the rebels to return to peace talks in Switzerland. Last week they pulled out of negotiations, accusing the government of attacks on ethnic Tamil civilians. The team of Norwegian envoys acting as mediators in the conflict has condemned the latest bombing, but said it was not drawing "any immediate conclusions about the possible perpetrators".